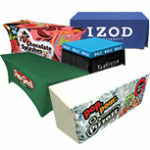 Creative Point of Display for Point of Sale. Indoors and Out. Where Branding Meets The Marketplace. Product roll-outs, in-store marketing, your brand is our business. High speed print and finishing delivers quality point of sale graphics and graphic systems to your doors, all shipped from central US location to improve transit time. Resources and Ideas: Experienced printers and fabricators with decades of industry knowledge and access to the best industrial and commercial substrates, dedicated to product quality and efficiencies that reduce cost. Management: Whether your promotion is a high-volume production with many components, or a small product launch, we retain total control of all pieces of the process, design, consultation, pre-flight, production and distribution. Quality Results: First off prototypes and samples delivered to your door saves timely press checks and are the collaborative insurance policy for quality and execution.